A large-scale, real-life experiment continues to be run. The "piston effect", as described elsewhere on these web pages, makes it more difficult to attain the 0.07 ppm 8-hour ozone standard compared to the 0.075 ppm standard. The piston effect says that as ozone control strategies are implemented, the hourly distribution of ozone concentrations will not decrease uniformly, with the highest concentrations decreasing faster than the concentrations below the highest level. The result of the "piston effect" is that as new control strategies are implemented, the states, tribes, and the US EPA will see some progress in the reduction of hourly average ozone concentrations at sites that experience 0.10 ppm and above. These reductions will translate into lower 4th highest seasonal 8-hour daily maximum concentrations. As the states, tribes, and the EPA continue to strive for further reductions in the 8-hour average concentrations by attempting to reduce the hourly average concentrations below 0.09 ppm, because of the "piston" effect, progress will begin to slow down. The EPA, tribes, and the states may notice that the implemented control strategies may not working as effectively as models originally predicted and may conclude erroneously that more stringent local controls will be needed. In some locations, the 8-hour standard will be attained for specific years but in other years, the 8-hour standard may be violated at the same location. As the years go by, an oscillation in and out of violation may occur. Please visit our concerns web page to follow the progress made in meeting the 8-hour standard. On that page, please note the decrease of the trending in the 8-hour ozone concentrations nationwide in the shorter trending period compared to the longer trending period. Research reported in the literature has described the problems in reducing hourly concentrations of ozone. Lefohn et al. (1998) identified those sites that demonstrated a significant reduction in ozone levels for the period 1980-1995. Using the data from the sites that experienced reduced ozone levels over the period of time, the authors investigated whether the rate of decline of the mid-level hourly average concentrations was similar to the rate experienced by the high hourly average concentrations. The analysis indicated that there is a greater resistance to reducing the hourly average concentrations in the mid range than the hourly average concentrations above 0.09 ppm. 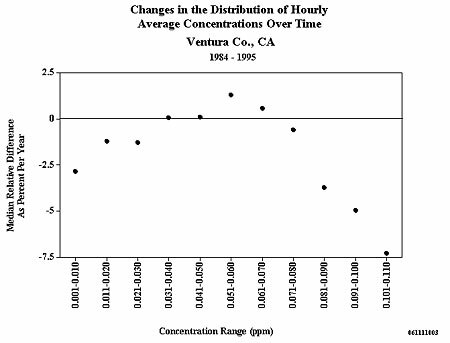 Figure 1 below is an example that shows that the higher hourly average concentrations (i.e., above 90 ppb) decreased at a faster rate (greater negative rate per year) than the hourly average concentrations in the mid-level range. The numbers of hourly average concentrations in the low end of the distribution also decreased. Both the high and low ends of the distribution moved toward the center of the distribution. of hourly average ozone concentrations at two monitoring sites. The Custer National Forest site in Montana experiences very low maximum hourly average concentrations. The distribution of the hourly average concentrations at the site shows a lack of both high and low hourly average concentrations. The number of lower hourly average concentrations is reduced because of a lack of NOx scavenging. As reductions in emissions occur, the shift from the lower hourly average concentrations to mid-level values is expected to occur. For 1980, more than 10% of the hourly average and 8-hour daily maximum concentrations at the site were above 0.05 and 0.059 ppm, respectively. The hourly and 8-hour daily maximum concentrations above 0.05 ppm at this site may not be associated with long-range transport of ozone and its precursors from more polluted locations. The site experienced its highest hourly average concentrations in April and May; this is when most sites in the United States do not experience high hourly average average concentrations. This, coupled with the observation that the diurnal maximum concentrations occurred between 1400 and 1500 local time, implies that the ozone may have been generated locally or meteorological processes are transporting the ozone down from aloft. The sources for creating the ozone may have been natural (e.g., stratospheric intrustions). The distribution pattern of the hourly average concentrations for a heavily urban-influenced monitoring site at Jefferson County, Kentucky is shown in Figure 2. 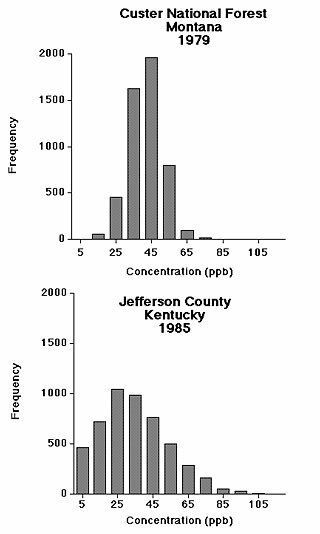 In contrast to the rural site in Montana, the urban-influenced site in Kentucky showed frequent high and low hourly average concentrations. This site appeared to be influenced by NOx scavenging because of the occurrence of more frequent low hourly average concentrations. Lefohn et al. (1998) reported in their trends analyses, that as ozone levels improved for several urban sites, both the high and the low hourly average concentrations moved toward the 0.03-0.06 ppm range, which is within the range of concentrations that most frequently occurred at the rural site in Montana. Lefohn et al. (1998) hypothesized that as adequate control strategies were implemented, the distribution pattern of hourly average concentrations for inland monitoring sites would approach the pattern observed at the Montana site and other remote sites in the western United States. Coyle, Fowler, and Ashmore (2003) have reported for an analysis of United Kingdom monitoring data that peak ozone concentrations declined by about 30% over the past decade, but that there was evidence of an increase in annual mean concentrations of about 0.1 ppb per year. Using simulation modeling, the authors reported that the lower concentrations increased. Although the authors hypothesize that this increase may reflect the impact of global increases in background concentrations, such is not the case. As emissions reductions occur, at many sites there are increases in O3 concentrations at the lower levels, which is consistent with data obtained in both the US and Europe (Lefohn et al., 2017). This is mostly associated with reduced titration of O3 by reaction with NO in response to reductions in NOx emissions (see Lefohn et al., 2017). The shifting of the lower concentrations toward the mid values results in many cases with the median and annual average concentrations increasing (see Lefohn et al., 2017). The use of annual average and median O3 concentrations in global modeling for validation purposes obfuscates the validation of the models due to the "shifting" effects associated with the reduction of NOx scavenging. One would assume that emissions reductions would result in lower O3 concentrations, but such does not occur when focusing on median and annual average concentrations. As noted above, Lefohn et al. (1998) reported decreases in the frequency of the lowest ozone concentrations and increases in the mid-level concentrations and believed that the decreases in frequency at the lower concentrations were due to reduced NOx scavenging. In addition, (as noted here and here) no changes have been observed in the 4th highest 8-hour concentration at some remote and relatively remote clean national park sites in the United States. Lefohn et al. (2017 in publications list) also noted that some sites in the western US experienced no trends in surface ozone concentrations using several exposure indices related to human health and vegetation. The "piston effect" is real and it appears that the implementation of politically acceptable control strategies may never be able to allow many violating areas to reach attainment on a continuous basis when the standard is lowered to lower and lower levels. Some nonattainment areas will continue to oscillate into and out of violation. Nature has provided us with the "piston effect" and the challenge is how best to work with it. Our research continues on the "piston effect". In assessing the efficacy of air pollution reduction programs, it is important to determine whether 1) expected emission reductions have occurred, 2) actual emission changes resulted in changes in ambient concentrations consistent with the predictions of air quality models, 3) changes in ambient concentrations have resulted in reductions in human and ecosystem exposure to the air pollutants in question, and 4) reductions have led to improved public health and reduced damage to sensitive ecosystems. If inconsistent observations are found to occur, then it is quite possible that there were problems with the assumptions used in the development of the 8-hour standard. If so, it will be necessary to assess the physical, biological, and mathematical methodologies used to develop the ozone standard prior to reaching the simple conclusion that more emission reductions are needed. It is important to better understand the physical and biological processes at work. The answer may not lie necessarily in more stringent emission controls, but in assessing whether the form of the 8-hour average standard could be replaced with a different form that will provide for the same amount of human health protection and yet be attainable. A.S.L. & Associates is actively performing research in this area with several key international investigators. Coyle M., Fowler, D. and Ashmore M. (2003) New Directions: Implications of Increasing Tropospheric Background Ozone Concentrations for Vegetation. Atmospheric Environment. 37:153-154. Lefohn A. S., Shadwick D. S. and Ziman S. D. (1998) The Difficult Challenge of Attaining EPA's New Ozone Standard. Environmental Science & Technology. 32(11):276A-282A. Lefohn, A.S., Malley, C.S., Simon, H., Wells. B., Xu, X., Zhang, L., Wang, T., 2017. Responses of human health and vegetation exposure metrics to changes in ozone concentration distributions in the European Union, United States, and China. Atmospheric Environment 152: 123-145. doi:10.1016/j.atmosenv.2016.12.025.